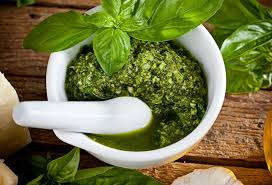 Pesto in a jar is a convenient cupboard standby, but high in salt. This version is made within a few minutes and is just as tasty. Cook the spaghetti according to the packet’s instructions. Meanwhile, place nuts, garlic and olive oil in a blender or food processor and blend for a few seconds to break up the nuts and garlic. Alternatively use a hand blender and allow a little longer. Then add the basil leaves, lemon juice and black pepper and continue to blend until you have a thick, smooth paste. Add more lemon juice and black pepper to taste. The mixture is ready to use. It keeps well in the fridge with a thin layer of olive oil on top to exclude the air for 3–4 days. You can also freeze it in ice cube trays and have handy portions on standby at any time. Spread in a toasted sandwich with mozzarella and sliced tomato. Toast a wholemeal pitta bread, spread a little pesto inside, then fill with cottage cheese and fresh salad. Spread over a fillet of fish, chicken portion or meat chop before grilling or baking it. Add a spoonful to pep up some homemade low-salt soup.